On the 25th and 26th of August, the DARE Advanced Control Team (ACT) performed an unique windtunnel experiment with the first actively stabilized rocket of DARE. 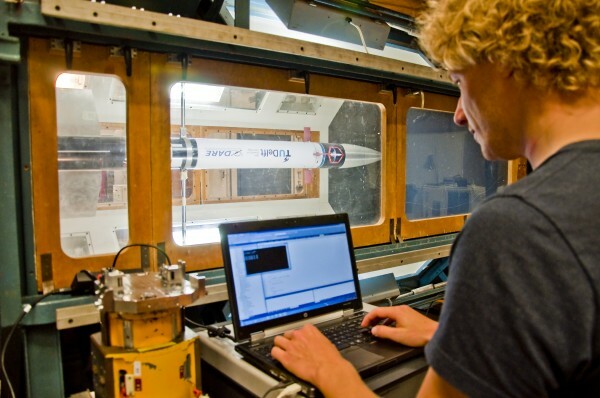 After 12 months of research and development the V7S rocket, which is a modified version of the CanSat Launcher V7, was tested at the Low Turbulence Tunnel of the Aerodynamics Laboratory of the Delft University of Technology. The goal of the experiment was to test if the V7S is able to correct its attitude with respect to the airflow. The V7S was developed during the minor 2013/14, requested by DARE, after the Minor the ACT continued with the project. The V7S can control itself during flight by deflecting four canards, which are located at the nose of the rocket. 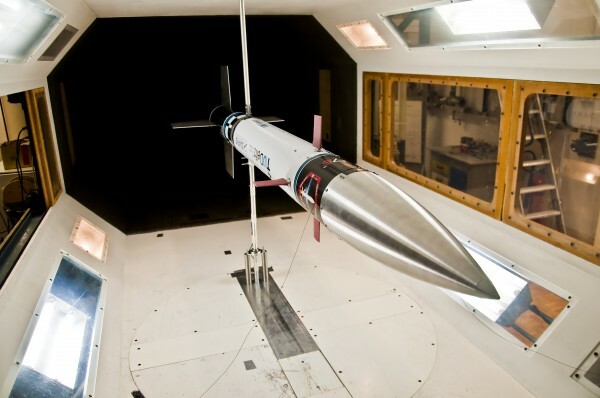 The purpose of active stabilization, is to ensure that the rocket can keep flying vertically without getting influenced by side winds at higher altitudes. By maintaining vertical flight, the rocket can achieve higher altitudes. 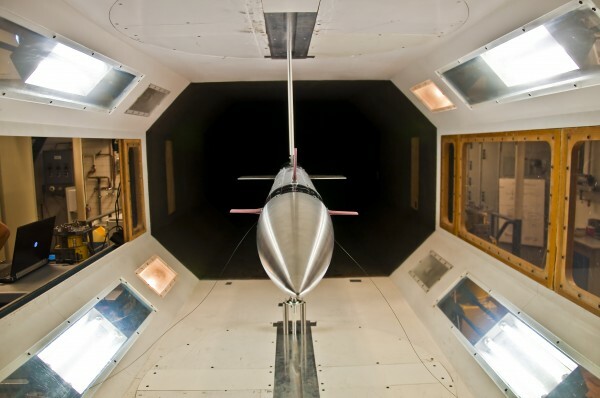 The windtunnel experiment is used to investigate the behavior of the rocket when the canards are deflecting. ”Launching rockets in the sky is easy. Launching them up completely vertical, that is tricky.” This is what makes the ACT special within DARE. It is the first team which produces a actively stabilized rocket and if the V7S is successful, DARE enters a new era of actively stabilized rockets. Therefore the ACT can be seen as the first step in the journey of new advanced rocketry of DARE. The result of the experiment is that the V7S can indeed actively stabilize itself during flight with the canards, while still being auto-stable in case of canard failure. This means that if the canards fail during flight, the rocket will not perform crazy maneuvers but maintains a stable ballistic trajectory. The canard deflections during the windtunnel experiment were manually. Due to a last moment failure in the electronics system, the active stabilization system of the flight computer could not be tested. The flight computer was unable to measure the angle of attack, which is necessary to determine how much the canards should deflect in order to stabilize itself. Once this error is fixed, the V7S will actively stabilize itself via the flight computer and is ready to be launched.